Do You Lose Your Calmness And Keep On Worrying While Travelling With The Infant Or Toddler, Need To Keep Continuous Watch On The Rear-Seat Baby While Driving? Start Using The ‘In-Car Play Center ‘ For Your Baby. Provide Your Baby The Entertainment That Would Keep The Baby Occupied With Fun Toys. In-Car Play Center – This is the colorful illustrated Play Center will keep your baby engaged in car travel. 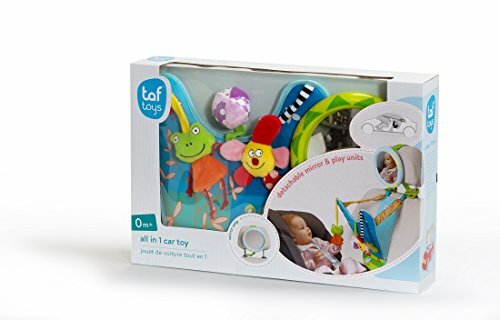 Babies Boredom In Long Travels – Babies traveling in rear car seat could be kept happy playing with cute, lovable hanging toys which dangle cheerily in front of baby. 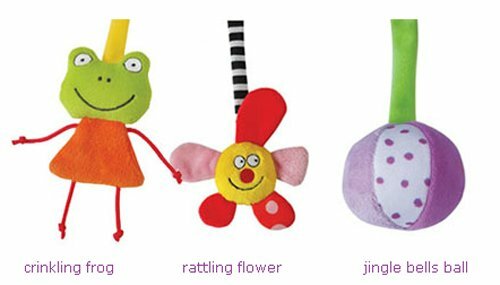 The richly colored crinkling frog, jingle bells ball and rattling flower toys will all help baby to keep entertained during long car journeys. Safety Mirror – The curved baby-safe car mirror can be used alongside or separately from the play center that allows parent to keep a watchful eye on baby from the driver’s seat with maximum view. Easy Attachment And Adjustable – Both parts of the In-Car Play Center toy are easily attached to the seat head-rest by means of a strong Velcro locking strap and 2 large plastic rings, along with angle adjusting straps. The rear view mirror attaches to the car’s headrest with a wide Velcro strap and it also have an extra strap and a plastic ring, to attach to the headrest metal pole for extra safety. Important – Always attach toy’s two triangle plastic rings to the car seat headrest metal poles. Suitable only for cars with adjustable headrest with metal poles! Adjust height and angle with Velcro straps for baby’s reach. ✓PERFECT FOR DRIVING PARENTS WITH INFANT AND TODDLERS – There are times when parents need to carry the baby along with them that adds worry when they have to keep the baby alone on rear seat. This toy is suitable for new born infant and toddler, sitting rear facing, on the back of the car. ✓ATTACHABLE TO CAR SEAT HEADREST – The toy is suitable only for cars with adjustable headrest with metal poles. There are two attachable triangle plastic rings to attach to the headrest metal poles. 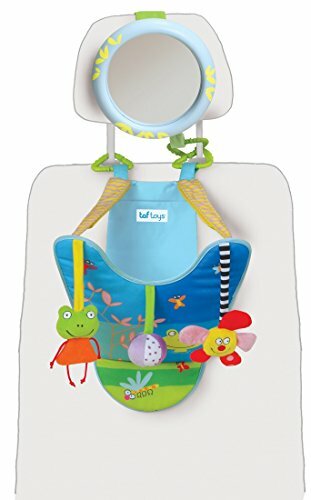 ✓BABY’S ENTERTAINMENT IN TRAVEL – This is especially designed toy for babies travelling by car. Generally travelling is very boring for the little ones. Some babies don’t like car rides and are annoyed. You can make the baby playing with the hanging toys which will entertain and soothe them. 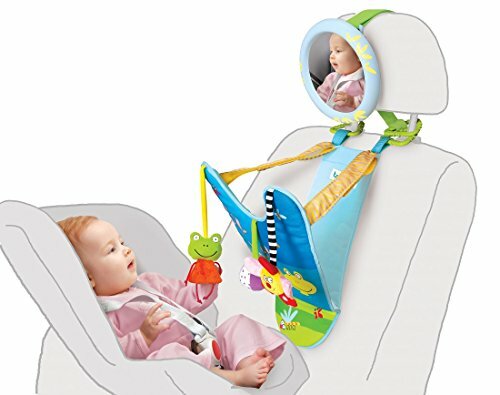 ✓BABY-SAFE CAR MIRROR – The one more important thing for parent is Baby-Safe mirror. 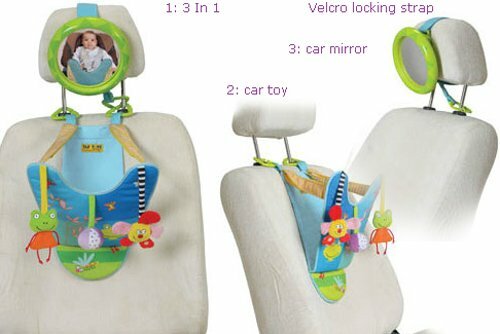 The mirror is curved and of high quality which is very helpful for parents to keep watch on the baby from the driver’s seat, with maximum view. This facility allows easier drive and easier Parenting.